All FlexGui licenses can be bought through NACHI-FUJIKOSHI. 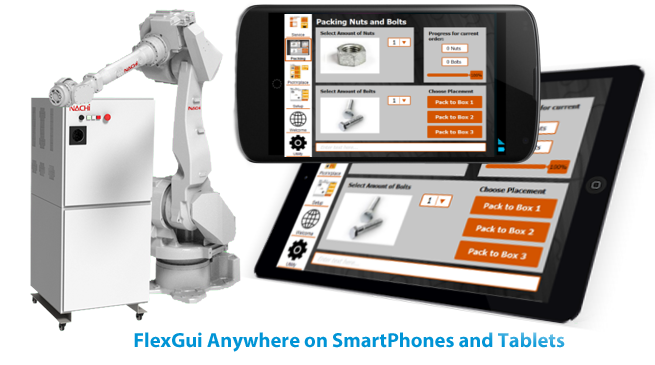 FlexGui Anywhere enables you to monitor and control your robots as well as assist your robot operators from your smartphone, tablet or browser. This is done by extending the FlexGui Remote feature which gives you unique convenience and flexibility in remote support and assistance to your shop floor or clients. Android version – runs on Android smartphones and tablets. iOS version – runs on iPhones (4 and up) and iPad (2 and up). When buying a FlexGui Anywhere license, all of the products above can be used to access FlexGui’s remote assistance solution. This gives you unprecedented convenience and mobility when giving support to your customers or colleagues. 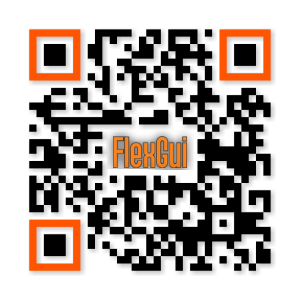 To download the FlexGui Anywhere app for your Android or iOS device, please go to the Google Play Store or the Apple App Store, respectively. You can also read the QR-code provided below using your phone. The pricing for FlexGui Anywhere is TBA.